Mhumhi wished that it took him longer to understand Bii’s betrayal, but of course he should have seen it coming- in fact had suspected it- and in the end, not acted. He very nearly did not blame Bii for it; it was his own foolish fault. Kebero, though… Kebero had given him surprise and a great deal of pain. He squeezed his eyes shut for a moment, blocking out the sight of the wolf’s yellow eye glaring down at him. The teeth still around his throat were harder to ignore, as the wolf’s open mouth began to drool on his fur. 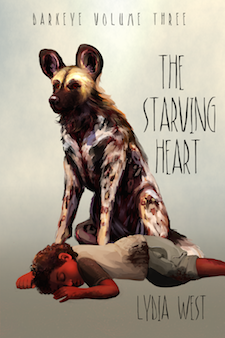 “Get the hyena quiet,” he heard one of the painted dogs say, and he opened his eyes again. Vimbo was still whining and struggling, caught as he was between four pairs of jaws, blood streaming from the wound on his nose. Each twist of his was still powerful enough to drag them slightly to and fro. Mhumhi tried to look over at Kutta, too, but it was hard to make her out from his prone position. He could barely see the rising and falling of her chest behind the legs of the wolf holding her down. She was facing towards him, away from the direction that Bii and Kebero had gone in; he wondered if she had seen them leave. One of the painted dogs addressed him sharply, and he jerked, making the wolf’s jaws around his throat tighten slightly. He choked. “Ease off,” said the dog, trotting a little closer to him. She lowered her head to sniff his, making him flinch, blinking his eyes at the unwanted proximity. The wolf obliged, stepping sideways while still keeping his grip tight on Mhumhi’s throat. The painted dog moved around and let her nose hover just over Mhumhi’s rear leg, so that he could feel her warm breath on the exposed pink skin there. Mhumhi tensed, the muscles in his neck bunching against the points of the wolf’s teeth, and he thought he saw Kutta’s chest stop moving for a moment. The female dog turned her dark eyes on him. Vimbo’s whining and yowling had indeed only gotten louder, and he was continuing to struggle, even though two more dogs had moved to brace themselves against his shoulders. The female eyed them for a moment, then looked down at Mhumhi. “Give him his throat,” she told the wolf, and it let go, slobber falling on him as it drew away. When he tried to rise it stabbed a paw down onto his chest, holding him flat. “Gently, Ashina,” the painted dog admonished. “He can’t very well expect to get away now. Right, little pup? Little Mhumhi?” She smiled down at him. Mhumhi stared at her for a moment before it suddenly clicked. He recognized her. “You’re Nzui,” he said, numbly. “You remember me?” She sounded pleased, wagging her tail. “I’m glad. You seemed like a nice puppy. A little lost, but…” She broke off, glancing with annoyance at Vimbo, who had just let out a particularly loud squeal. Mhumhi lay there for a moment, feeling the unpleasant pressure of the wolf’s paw still on his chest. Mhumhi said nothing, and she laughed and continued. “Well, he’s a liar,” Mhumhi said coldly. Nzui gave him an odd look, then laughed. “Well, I suppose it is in his nature.” She rose from her haunches and went over to the dogs holding Vimbo. The dogs obeyed her like a single animal, though Mhumhi saw fear on some of their faces. Suddenly freed, Vimbo whirled around in the little circle of them, squatting low and panting, bleeding in several places. The dogs obeyed, merging back into the larger circle that surrounded the lot of them. Vimbo gave a series of grunts, dragging his rump against the ground, rolling his eyes, and then lunged towards Kutta. Mhumhi gave a strangled yelp, straining against the hard paw on his chest. The wolf holding Kutta down sprang away, back into the crowd, and Vimbo went after him in a lumbering charge, his heavy hindquarters swaying, before coming to a sharp stop and turning back to Kutta. She was getting up, slowly, and Vimbo moved to skulk beside her. Mhumhi did not respond, for he had locked eyes with Kutta. She looked more angry than frightened, her ears laid back and her eyes narrowed. Vimbo bumped up against her side, seeking comfort, and she allowed the contact, though she did not reciprocate. “You mean to let the three of them travel unrestrained?” demanded the wolf that was holding Mhumhi down. Her eyes drifted to Mhumhi as she spoke, and he couldn’t help but snort. The threat was none too subtle. The wolf gave a grunt, looking displeased, but he lifted his paw and backed away. Mhumhi got to his feet slowly. “We won’t have far to walk; we’re just going to get into the trolley car,” Nzui told him, as though she meant for it to be encouraging, then rejoined the crowd. The mass of painted dogs around them began to move, chattering and whining, and Mhumhi, Kutta, and Vimbo had no choice but to move in the space within them. Mhumhi took the opportunity to get closer to Kutta, edging away Vimbo, who was still whimpering close beside her. He wrinkled his lips as a number of round ears turned back towards him at his words. Kutta noticed them too, for she glared around a bit before speaking. He thought he heard scattered laughs around him at this, and Kutta drew her lips back from her teeth. There were no laughs this time. Mhumhi saw some stiff tails instead. “Only a point I thought ought to be made,” she said, but she kept her jaws shut after that. The painted dogs led them through Oldtown at a brisk trot, keeping bunched close together, though occasionally one or two would break off at a time to trail down a side street. On one of these excursions Mhumhi heard some yelping- it seemed that they were clearing away dogs that happened to be outside. He tried to pull his thoughts together and figure out where they were going- this was his hometown, after all, though it felt a sore long while since he had roamed it aboveground… There were pawprints everywhere on the dusty streets, big tracks of painted dogs, and he could see that Bii had not lied about there being blood strewn about, though it was well-dried now. There were hyena bodies too, gray lumps of still fur, but these seemed to have been dragged carefully out of the street. They reeked in lines on the sidewalk, flies buzzing about them. Mhumhi finally got his bearings, then shared a confused glance with Kutta, for she had noticed it too. They seemed to be heading directly for their old home. But no- soon after they passed through the alley with the blue dumpsters (the pack of them narrowing tightly so that for a moment there were only brick walls on either side of Mhumhi, Vimbo, and Kutta), they came to a full stop. Mhumhi was confused, for they had stopped in the middle of the broad main street, where there were no landmarks of note aside from the long rail in the ground- the rail that Sacha always reminded him to jump over, for it sometimes tingled unpleasantly with electricity. One of the dogs broke away from the pack to stand in a little kiosk that was erected next to the rail. Mhumhi saw that this dog was wearing something odd- a sort of bunched elastic around his leg, near the elbow, with a lump of something in it. The dog stood on his hind legs and put his paw over a gray square in the kiosk. A few weeks ago this would have completely bewildered Mhumhi, but now he was easily able to put two and two together: the elastic thing had to hold some sort of white card inside, and the dog was passing it over the gray square to activate it. But what for? There were no doors that needed to be opened around here. He got his answer in another moment, for the ground underneath his paws rumbled. He froze, and looked down. Was the ground itself… opening up? It was not, though he saw amused glances being directed his way. Instead something was sliding towards them from a distance, something large and rectangular. Mhumhi found himself alarmed all over again. It looked nearly like- well, it looked like a set of small, oblong houses, moving along the rail all under their own power! The other dogs seemed quite calm about this, bored even, and none of them jumped when the enormous thing came to a stop directly in front of the lot of them, and opened its own doors. “Go in,” Nzui told them, when they balked. The painted dogs were already hopping up into the thing. The ones behind them were driving them towards a specific set of doors- to trolley car, she had called it. Kutta still looked frightened, and was trying to catch his eye. Strangely enough, Vimbo seemed to be the calmest of the three of them, not having batted an eye as the thing approached, and was now looking to Kutta as if awaiting further instruction. Mhumhi decided that the thing was clearly an object meant for hulker locomotion, like the regular cars. Vimbo must have seen something like it before during his time spent underground. He nudged Kutta with his shoulder and then hopped over the small step and inside, panting a little from anxiety. Within the car there was a curious array of hard plastic seats, which many of the painted dogs had arranged themselves on. Most had put their chins down on the armrests or even over the edges, looking bored. The only other thing within the trolley was a series of metal poles that stretched all the way to the ceiling. The car rocked very slightly as Vimbo and Kutta jumped in together behind him. At once Vimbo lay down in the center of the floor, extending his still-bleeding leg to lick it. More dogs followed behind them, and then the door slid closed. The trolley began to move, and Mhumhi, standing stiff-legged, nearly fell over due to inertia. There were scattered whuffs of laughter from their captors, who were lounging all around. Mhumhi decided that Vimbo had the right of it and crouched down, keeping his center of gravity close to the floor. Beside them Kutta stood up stubbornly, her tail raised. The trolley picked up speed, so that the bits of houses and buildings Mhumhi could see through the raised windows sprinted backwards, past the blue sky. Beside him Vimbo gave a little keen. He turned to look and saw that the hyena was looking at him, his round black eyes as inscrutable as ever. His nose and neck were still bleeding freely from the painted dogs’ teeth. Mhumhi wondered that he hadn’t gone mad with fear. Surely nothing in his tamed life had prepared him for this. But no, now that he thought about it, VImbo would be used to strangers taking him this way and that, leading him from one cage to the next, always expecting him to be placid and docile about it… He leaned forward and licked the hyena’s bleeding nose, ignoring the jeers and utterances of disgust it incited. The hyena’s blood, at least, tasted just the same as dog blood. “Stop it, stop it, I’m going to vomit,” cried out one of the dogs, rising up a bit in her seat. There were mutters of agreement. “You all are filth,” spat Kutta, and much to Mhumhi’s surprise she bent down and began licking the wound on Vimbo’s neck. Vimbo seemed surprised too, to suddenly receive so much attention, and squirmed a little, but Kutta braced a paw on his thick shoulders and stubbornly kept at it, her ministrations looking none too gentle. Mhumhi supposed that with the hyena’s thick skin and fur it was actually better off that way. The trolley went on, rocking and rattling. Mhumhi raised his head enough to realize that they were near the very edge of Oldtown, from the way the buildings looked, and then they rose up and suddenly all he could see through the window was the cloudless sky. His curiosity got the better of him, and he left Vimbo’s tending to Kutta and walked unsteadily over to rear up against the window. He gave a soft gasp, for he could see a thick black line snaking past underneath the trolley- unmistakably, it was the dispensary. So they had already crossed Wide Street! But how had they got so high up above it? Dimly he put it together in his head. They were on top of the concrete overpass, the one he and his family always hid underneath to eat their meat. No sooner had he come to this realization than the window went black. He was so startled he fell back onto all fours and nearly onto one of the painted dogs, which growled at him. All the windows were black, though there was still light within the trolley car- there were rows of lights on the ceiling. Warily Mhumhi got back up, his paws on the sill, and peered back into the darkness. The air rushing around them was making an odd sound now, hollow-sounding, familiar-sounding. They were in a tunnel. They were going back underground. Something bright suddenly flashed by him, and he jerked, but managed to keep his balance. His claws scraped against the plastic as he tried to anchor himself more securely, and there- again- something was coming close, and this time he was ready, staring at the bright thing. It was a bright wide square, lit from behind, and a smiling image of a hulker’s face was stretched out over it. No, they were moving, these huge stretched flat images- there, that one had thrown its head back in a parody of laughter, this one brought an object Mhumhi couldn’t make out to its chest- He whipped his head around, and saw that the picture had repeated- or stuttered somehow back to the motion it had started with. Flat dead images of hulkers were unnerving enough, but these repeating, moving ones… Mhumhi shuddered and got back down. He was getting used to the rocking motion of the car, and walked a little more easily back to Vimbo and Kutta. Vimbo looked like he’d gone to sleep, curling up on his side, and Kutta looked drowsy as well, though more angry than ever about it. Mhumhi did not blame them. There was something about the rocking of the car and the rushing, enveloping sound of air that was oddly soporific. He lay back down next to Vimbo, hardly bothering to care about the hyena’s rank fur touching his, and put his head down on the thinly carpeted floor. From his low position he could only make out the bright gleam of the tops of the hulker images as they shot by, something that suited him just fine. He wondered where they were going, how deep underground, how far away from the entrance to to the lair of the bouda. The laughing hulker images seemed to be a mocking reminder of the fact that with every second he was hurtling further away from the chance to see Maha and Tareq ever again.